She said she wanted it about a gargoyle. A flying, scaly monster that breathed fire that came out at night and roared as loud as the lawnmower. And there should be a girl her age who learns magic so she can save everyone from it. She should have horses but the horses didn’t have to do anything in the story there just should be horses. It started with Daddy telling it just like that: it was summertime in a kingdom that was beset by an evil gargoyle who struck once a month on each night without a moon, swooping down from the sky on wings ike a bat during the night’s darkest hour to blow its fiery breath over the farms and hamlets, destroying everything in its path (but not the horse farms, Ella’s Mommy amended; oh of course not the horse farms her father agreed). In one of those simple straw villages there lived a little girl named (pause) Ello. The name gave Ella a giggle. Ello lived with her Mommy and Daddy, but both of them were badly hurt in one of the beast’s attacks, leaving Ello to take care of the horses on her own. She spent all her days working in the horse fields, all her nights helping her injured parents (that means hurt, Mommy explained). Not playing at all? No not at all. What about bees? There aren’t any bees there. Did she have to wear sunscreen? Let Daddy finish, Ella’s mother said, it’s late. Something in Mommy’s pocket buzzed, but Ella’s father pretended he didn’t hear it even though you could tell he did. She didn’t know it, but as the little girl worked in the hot sun, a faerie who lived in the woods on the edge of the farm watched her, and felt bad for her. You can answer it, Daddy said without looking at Ella’s mother, but she gave him a look like he had written his 3’s backwards on his homework for the hundredth time. Come on Daddy, Ella prodded, and her mother said go ahead so he did. The faerie from the woods asked Ello why she worked all day by herself, and she told the faerie about the gargoyle and her parents and how she wished she was as magic as the monster so she could chase him away and everyone could be happy, but there was no one as strong as the gargoyle. Is this going to end soon? Mommy was fidgety, probably she had to go potty. Let him finish! Ella said, but her father said Mommy was right, it was late, he’d have to finish the story tomorrow. The last part he said before both parents gave her a kiss goodnight was that the faerie told the little girl there was one person as strong as the gargoyle, one who lived in a small clearing in the middle of the darkest, densest part of the woods: the Faerie King. When they left the room it was very quiet, as it had been all day. Some nights when her parents left her bedroom and walked down the carpeted steps to the main floor she could hear them talking, saying things about what they did at work or what would be on television that night, uninteresting things that weren’t worth straining to listen to. But for a few weeks, there was just quiet. Ella closed her eyes and surrounded herself with a fantastic kingdom, one where she’d have horses and commune with faeries on the edge of a dark wood. As she was falling asleep, she heard an engine start outside, but to her it became the distant roar of a gargoyle descending on some neighboring hamlet, one that she’d be off to battle soon. A hand shook her awake the next morning. It was her mother, who had sleepy eyes. Before Ella had even got out of bed, she asked if she could hear more of the story. What? oh from last night, not right now you have to get ready for school. If Ella knew any swear words she would have used one then, but as it was she said Spinach! — it was the worst word she knew. Mother and daughter both plodded downstairs, where father was pouring a cup of coffee and didn’t look up to greet them. Ella’s Mommy hurried through the morning routine, and as she brushed Ella’s hair into a pony tail, her fast hands caught a tangle that brought tears to the child’s eyes. Fine! Mommy yelled as she spiked the brush into the ground, if you can’t even get your hair brushed without crying you’re getting it all cut off. She stood up and saw Ella’s father watching, and walked past him fast without looking at him. Mommy, Ella started to say, but her Daddy stopped her. Here, I’ll get it, he said, and retrieved the brush. Can we finish the story tonight? she asked as he detangled the knot. The bedtime story, sure, he said, if I’m home on time. I may have to work late. He did have to work late, later than Ella’s bedtime. She had been with her mother all day after school, but played mostly by herself. Her mom gave her the obligatory That’s great when Ella finished a picture from a unicorn coloring book, and had tied Ella’s shoes for her with two knots apiece when Ella wanted to go on the swingset in the backyard, but most of the time her mother just sat somewhere quietly, sometimes opening her phone and pushing some buttons on it but not ever really looking at anything. Want to go to Nana and Papa’s this weekend? she asked out of the blue as she tucked Ella into bed. Ella nodded emphatically, Nana and Papa’s house meant lots of snacking and a completely different array of toys than she had at home. Okay, her mother said, sleep good, and leaned over to kiss her on the forehead. Ella recoiled. Mommy the story! Ella’s mother’s eyes were pinkish, she might have caught conjunctivitis, a pair of kids in Ella’s class got conjunctivitis and had to get eye drops. So the faerie was going to help her fight the dragon? No, Mommy, it was a gargoyle and Ello just found out about the Faerie King in the woods, Ella explained, and leaned eagerly forward. You’ll have to wait for Daddy, I don’t know what’s going to happen next. The child frowned, then asked when he would be back. Ella’s mother seemed as annoyed as when Ella dripped melted popsicle juice on the carpet after she had promised to be careful with it in the living room. I don’t know her mom said, when he wants to be. Ella lowered her head to the pillow and hoped she wouldn’t get conjunctivitis because she hated getting drops when they went to the eye doctor. It was quiet again that night except for more buzzing sounds and quiet talk downstairs, either the TV or Mommy on her phone, until much later, very late, when Ella woke up to the sound of the garage door opening. The attached garage was right under the upstairs bedrooms, and when it opened, especially in the quiet of the night, it rumbled and roared like the whole house was a living, groaning beast. Ella stirred and lifted her head. Across the hall, she saw the light from her Mommy and Daddy’s bedroom turn off. He must have been very sleepy from being at work so late, because the next morning he barely had his eyes open enough to see. Have fun last night, Ella’s mommy asked him, except it sounded more like she was saying it then asking. He said something back but whatever it was didn’t compete with SpongeBob, so Ella didn’t hear much of the conversation, it sounded like they were mad at time, it came up a lot like what time it was last night and who needed some time away and not another time. The next thing she heard was a hurried Bye Ella Love You from her Mommy, and her father said Bye back, but her mom was already out the door. He was back home at normal time after work that day. He sat down at the dinner table and before he could ask how school was, Ella asked for another part of the story. You don’t want to save it for bedtime? he asked, but Ella said no, just a little bit now please? (the long E of please was strung out for several seconds). Did Ello find the Faerie King? Her father glanced up at her mother, who was putting things into a duffel bag. He took a small bite of his dinner, and said that Ello did go into the woods to find the Faerie King. She walked along a path all the way until it ended, it was as deep as she’d ever gone into the woods before. But she kept going, even though the woods got thicker and darker with each step. All day she walked through the woods, and into the night, too — it was too dark to tell what time it was, the only ways she knew how long she had been walking were the growing hunger in her stomach and pain in her legs. Pain, honey — it means hurt, Mommy explained as she took a little bite of food. Her knees and ankles creaked and muck from the forest earth covered her sandals and oozed between her toes to fill the thousand tiny scratches that marked her feet. She walked forward until she couldn’t walk anymore, and her body went limp in the briar. It’s thorns, her mother said. She knows that from Briar Rose she meant what’s limp, Daddy explained. When you can’t move anymore and are all floppy, Mommy said, like sleeping. That was the only thing that they said to each other that night, Ella remembered, before each threw away the remaining portions of their dinners, which went mostly uneaten. It was pork chops, and Ella thought it was good. After dinner, her mother took her outside to the swingset while her father rested on the couch. When it started to get dark, Ella’s mother said it was time to go inside, and Ella asked if she finally could hear more of the story. Go in and ask Daddy, if he’ll get up, her mother answered. Ella ran inside and jumped on her father’s abdomen — it was her favorite way of waking him — and asked him to take her to bed. He started to say he’d never seen her so excited for bed before and looked at Ella’s Mommy, but she was typing on her phone so he stopped. Sure he said come on let’s go. Is she going to be OK? Ella asked. Her father looked scared for a second but then relaxed and said oh you mean Ello? Yes. When she opened her eyes she was lying in a clearing enclosed by a circular wall of tangled tree limbs. She was on a carpet of leaves, covered with a blanket of moss; her wounds were treated with a sticky sap. Wounds? Cuts and things, things that hurt. The faerie that she had met at the edge of the woods was there with her too, she had found Ello and brought her to the clearing. Before them stood a man with butterfly wings whose skin was covered with ivy and lichens. Mommy came into the room then, saying it was time to say goodnight. Please let Daddy finish, Ella begged, but her father told her no it’s late, we’ll do more later. At least tell me who the ivy man is, and Ella’s father said the faerie next to Ello told her Yes child, that is our abbé, the Faerie King. He kissed her on the forehead and left the room and her mother came in and kissed her goodnight, too. As her mother was pulling away Ella held on to her and said I thought the pork chops were good. In the middle of the night Ella woke up sweating, she had already taken off her thin blanket and sheet but was still hot. She called for help, and a moment later her father staggered in and she asked if she could sleep like a boy. Sleep like a boy? he asked. She said she was hot and wanted to know if she could take her shirt off. Her dad said fine, and started to leave the room, then stopped. He turned and said Ella honey, why do you think boys sleep like that? I don’t sleep like that. Ella wasn’t sure what to say. Then her dad said don’t worry I’m not mad, I just wondered why you thought boys slept with their shirts off. Where did you see a boy sleeping with his shirt off, on TV? You can tell me. Yes, she said with a shy smile, I saw one on TV. Her dad left the room to go to bed again but looked awake. Are we going to have to get eye drops? Ella asked her mother the next morning. Her mom’s eyes were pinker than before, and Ella was scared. Your eyes are fine, her mother replied. After school the two left for Nana and Papa’s house with the duffel bag her mom had packed. It was hot, but the best kind of hot, Slip-n-Slide hot. Did you bring my goggles Ella asked her mom (she loved the Slip-n-Slide but hated when water splashed in her eyes). Yes I did. Is Daddy going to meet us after work? she asked. No he’s not, Daddy’s staying home, Ella’s mother said. I don’t know. Mommy’s just a little sad. Ella petted her mom’s hair from her booster chair in the back seat. She never petted her mother before but it worked when their dog would shake at the vet. Nana and Papa were both excited to see their granddaughter and greeted her with big hugs. It felt good, bigger and happier than any hug she’d had in a while. Fuller. She spent the day playing, zipping down the Slip-n-Slide, her Papa even took her to a playground up the road. Her mother was on the porch most of the day, by herself, it looked like her conjunctivitis was really bad that day. Every so often Nana or Papa would go outside to talk to her, but after a few minutes she’d send them away. In the afternoon one of the neighbor kids came over to play as she often did when Ella came to visit. Every time Ella went on the porch her mother shakily said I love you. Twice she added, no matter what. When bedtime came, after giving kisses and goodnights to Nana and Papa, Ella’s mother placed her in bed (Nana and Papa had converted her mother’s old bedroom into Ella’s room when she visited, complete with a bed that had a headboard like a castle). Her mother saw that Ella was crying. What’s wrong honey? she asked. I’m sad you’re sad, Ella said. And I really want to hear more of the story. Ella’s mother said wait one minute and left the room. You sought me here, young wizard, and I shall take you as my student, the Faerie King said to Ello. Ask me what you wish about magic, I will tell you the answers you seek. Abbé, when will I learn to be as powerful as you, so that I might destroy the daemon? Ello asked. The Faerie King looked hard at the little girl. When your heart is clear of darkness, young wizard, for it is darkness that created the gargoyle. The Faerie King then set her about her chores. He told her she needed to first tend to all the needs of the forest, pulling every dead branch from every tree, so new ones might grow there. Even the biggest ones? she asked. Especially those, the Faerie King said, they need it the most. Ello knew it would take days, but she wanted so badly to destroy the monster that she worked as hard as she could. Just as she did during her long walk through the woods when she felt too tired to take another step, she pushed herself to keep going, and pulled them all down, every one. Her back and shoulders ached and she wanted to stop and lie down on the ground and sleep, but when she thought about stopping she pictured the gargoyle burning another town, and it renewed her fire. Once she was finished, she returned to the Faerie King. And then what? Ello said. And then you went to bed, her mother replied. Sleep good she whispered with a kiss, I love you. No matter what. They stayed the next night at Nana and Papa’s too, but Ella’s Daddy didn’t send any more of the story, or her Mommy didn’t look. She begged her mother to let them go back home, she missed her stuffed animals and was tired of the Slip-n-Slide and the park and wanted to be on her own swingset. It had only been two days, and it was fun, but it was enough — for reasons that she didn’t really understand Ella said they had to go back home, they needed to. But they didn’t, and Ella went to bed that night restless, storyless. It was getting dark outside and Ella was drifting to sleep when she saw beams of light through her window, piercing the inky night. They were headlights, she could hear a car pulling up to the house. In a few minutes there were voices outside, familiar but strange, like when people do impressions of presidents on TV. They were loud and mad, yelling what they wanted to say but the words didn’t match, like they were strangers and each one was having a different mad conversation with someone over the phone. One said you’re crazy and the other said you’re scaring me, and one said just let’s go in and talk and the other said I can’t do this anymore, and it got louder and madder and faster. When the car engine was on again Ella looked out the window, and saw an ivy covered man with butterfly wings come cascading down from outside to land on the bed next to her. Don’t worry he said. I want it to stop she said. It won’t go on forever he said. Outside, the car was pulling out of the driveway and the roar of the engine covered up what the yelling strangers were saying. A man hung on the side of the car as it backed up, holding on through the opened window. Can’t you make them stop use your power and help them Ella screamed to the empty room. She woke up late the next day and was confused, she didn’t remember what was dream and what was real. She had forgotten that she was still at Nana and Papa’s, and waking up to the strange surroundings startled her, for a moment she had no idea where she was except it wasn’t in her room like it should’ve been. Her mother was not awake yet even though the sun was up and hot and high. Ella went to her room and climbed on the bed and told her it was morning time. Her mother lifted her head slowly, her breath was bad but Ella didn’t tell her that. Are we going home today? Ella asked. I don’t think so. Ella started to cry. Nana and Papa did what they could to cheer up Ella that day, they took her to a place that had an arcade and putt-putt and go-carts, but she was unwaveringly grumpy. In the big box where you jump around in the balls she knocked down another kid who was smaller than her. She wanted to jump on his head, up and down over and over, but she didn’t, she just knocked him down and he started to whimper and cry and that made Ella even madder. Her Nana and Papa tried everything to make her happy: snow cones, elephant ears, cotton candy. The end result was that she was still mad, but also very very energetic. When they got home and had dinner (Papa was good at grilling, Ella loved the hot dog he cooked her but her mom hardly ate), Ella demanded more of the story. When her mother hesitated, Ella became so angry she growled. She was past sad now; now she was pissed off. She told her mom to at least call her dad so he could tell it over the phone, but she said she didn’t know if she could do that, come on let’s get your teeth brushed. When she returned to the Faerie King, Ello asked, Abbé, when will I learn to fly, so that I might meet the daemon in battle? When your spirit is lighter than the breeze, young wizard, the Faerie King said, and sent her about her chores. Now Ello had to gather up all the lightning bugs in the forest, every single one, and usher them all in a lightning bug herd to the clearing in the forest to create light for the Faerie King. Ello was good at catching lightning bugs (I am too) (I know you are) and within two nights she had brought them all to the clearing. When she returned to the Faerie King, Ello asked, Abbé, when will I learn to feel no pain, so that I might resist the daemon’s fire? When your resolve is stronger than steel, young wizard, the Faerie King answered, and set her about her chores. Resolve? Let’s just say heart, Ella’s mother said. More typing, another buzz. This time Ello had to collect dew from the morning mist and use it to fill a jug that she could take to all the forest denizens — good god denizens how old do you think she is? Mommy asked the phone, then typed something, when it buzzed again she laughed. The squirrels and opossums and forest animals, Ella’s mother said, and added I think we should ask what happens next. Ella knew it was super late but bounced with elation. Yes yes yes let’s do more. The phone buzzed again. When Ello had finished watering the forest denizens, she returned to the Faerie King. Abbé, when will I learn to master fire, so that I might match the daemon’s power? When your passion grows hotter than the sun, young wizard, the Faerie King answered, and set her about her chores. Passion? Love, strong feeling, her Mommy said. Love she said again. She couldn’t say it enough. Love. Love. Let’s stay up all night Mommy! And on the next night without a moon, then did the young wizard take flight to do battle with the gargoyle. Really? Ella asked. Really. Taking everything she learned from the Faerie King and the forest, she flew into the dark sky and followed the sound of the roars. When she found the gargoyle, it was hovering — like, floating — over another small straw hamlet, and it raised its dark eyes to Ello. Then, we have to wait a little bit. Is Daddy sending another note? Ella asked. Not exactly. In a few moments, there were headlights outside again, an engine drew near and turned off. Ella’s mother rose and went to the front door, and Ella couldn’t hear any words, but a few minutes later both Ella’s mother and her father walked into the room. Together. They each sat on the castle bed and Ella’s Daddy said I missed you. I missed you, she answered. Ella noticed how they still weren’t able to really look at each other. They’d glance up and then back down. They could look at Ella and the floor and that was it, like at Ella’s last birthday party when she tried to get her friends from softball to play together with the neighbor kid from Nana and Papa’s, but they didn’t really play with each other except as far as they all played with Ella at the same time. So I guess you’re ready for the rest of the story, her Daddy said. 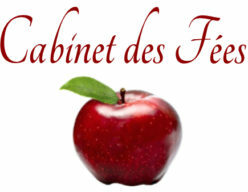 Oh — yes! Ella had forgotten. In a flurry, Ello dove towards the gargoyle, who swiped at her with its claws and covered her with his fiery breath. But Ella’s flesh (that’s skin) was proof against the fire and hardened against the claws, and her body swirled without weight through the air. She used her own fire, fire she had learned to grow inside of herself, and bathed the gargoyle in it, and the monster howled in pain. (I hate baths too.) She tore at the beast with all her strength and it fell like a blazing meteor down, far down to the ground. And when the smoke from the battle took flight on the winds, Ello landed and stood over the gargoyle’s crumbled form. It’s scales were wrenched asunder — apart, that means apart — and beneath them the profane (nevermind) beast had a familiar face. Abbé…? the young wizard started. Your wish is met, young wizard, he said weakly. You have become as powerful as me. Your will to destroy me has made you mighty. And with that, the Faerie King Gargoyle breathed its last damp, mossy breath. It was then that the young wizard tasted the fire on her breath and felt how hard her flesh had grown with scales, covering her body to the shoulder where her two leathery wings had sprouted. She had won; she had won. But there was still rage in her like hunger. So once again she took flight, soaring over the kingdom, feeling strong in the black moonless sky, and she started spreading fire all over the kingdom below. Feeling that the sun would rise soon, she dove into the forest and took her perch on a moss-covered stone in a clearing in the deepest, darkest part of the wood, and awaited a pupil. The End. Ella didn’t look satisfied. I wanted a happier ending she said. Ella’s mother looked her father for a long time. Me too she said. She paused. But it might be too late now. No he said back to both of them, we can still change it. Wait, Ella interjected. I changed my mind. A happy ending isn’t what I want. Her parents both looked at her very seriously, like they needed her help. Why her mother asked; Why her father repeated. Because, it’s still an ending, she said quietly, and added So then what happened? Make sure there’s horses. Scott Christopher Lucas is a father, writer, and web designer, usually in that order. He lives in Cleveland, Ohio, US. 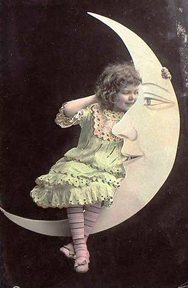 Image: Paper Moon, vintage postcard. Public domain.